Chatrapati Multistate (Chatrapati Multistate Credit Co-Operative Society Limited),Pune Published Job Notification for 15 Branch Manager – Cashier & More Posts. Candidates who wish to apply must look at Chatrapati Multistate Branch Manager – Cashier & More Recruitment 2018. Eligible candidates can join Walk-in Interview on: 02-04-2018 & 03-04-2018. Interested & Eligible candidates may attend for walk in interview along with all the documents addressed at which is mention in official advertisement. Starting Date, Last Date to Apply Offline at Chatrapati Multistate Credit Co-Operative Society Limited which candidates should be remembers as follows. Walk-in Interview on: 02-04-2018 & 03-04-2018. 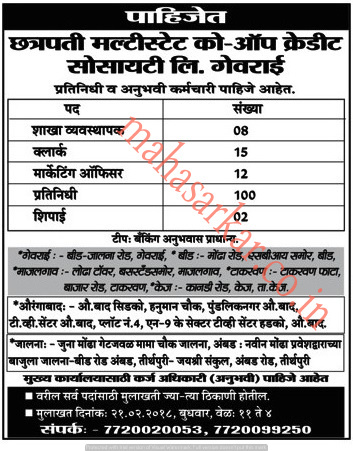 Chatrapati Multistate (Chatrapati Multistate Credit Co-Operative Society Limited), Published Job Notification for 137 Clerk – Executive & More Posts. Candidates who wish to apply must look at Chatrapati Multistate Clerk – Executive & More Recruitment 2018. Eligible candidates can join Walk-in Interview on 21-02-2018. Interested & Eligible candidates may attend for walk in interview along with all the documents addressed at bellow given address which is mentioned in official advertisement. Chatrapati Multistate (Chatrapati Multistate Credit Co-Operative Society Limited), Georai Published Job Notification for 11 Officer – Clerk & More Posts. 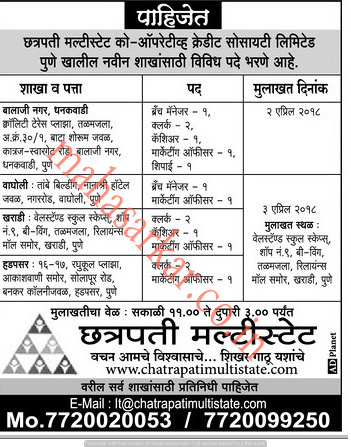 Candidates who wish to apply must look at Chatrapati Multistate Recruitment 2017. Eligible candidates can apply offline before 07-07-2017 (07th July 2017). Education Qualification: Must be passed 12th/ B.Com/ M.Com/ MSC/ MCM. For Post wise Education Details follow the detailed advertisement. 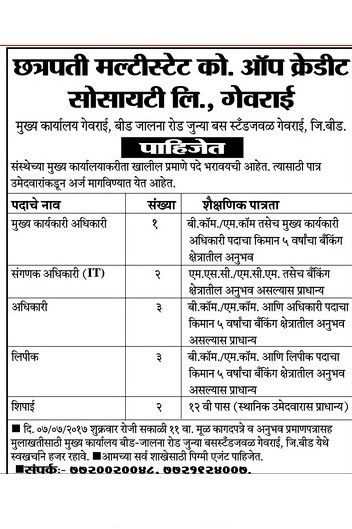 Interested & Eligible candidates may attend for walk in interview along with all the documents addressed at Beed Jalna Road Near Old Bus Stand Georai 431127. Starting Date, Last Date to Apply Offline at Chatrapati Multistate Credit Co-Operative Society Limited which candidates should be remember as follows. Walk-In-Interview Date: 07-07-2017, 11:00 am.